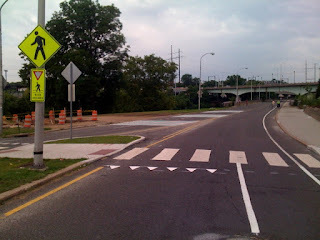 On Saturday sawtooth Yield bars were added before the crosswalk, soft (thermoplastic) rumble strips added on the inbound side of MLK Drive. Still to come rapid flash pedestrian crossing warning lights (but not this summer). any word on how the people who were hit here are doing? The family wishes that we respect their privacy but I can tell you that they are both recovering.